Exams are a nightmare for students. People complain of lack of time and concentration and many other concerns including forgetfulness right before they enter the exam hall. If there was an easy way, we could have had these exams banned. But, it is impossible! All are not qualified to pass GATE, and only the deserving candidates should be provided entry for MTech. And, GATE is the deciding factor. Keep Calm and embrace the challenge. You’ve been managing everything so well until now, just a little more, and you are there. What are the activities you perform before you go to sleep? The usual things that people do are watching T.V., chatting with friends, or listening to music. So during exam times, you can bring about a change to your usual habits. You can utilize the time to study. Research shows that the brain has a greater capacity for remembering all that you studied right before falling asleep. The brain has the power to absorb everything that it reviewed before you slept the night before. Is there a chapter that you find hard to study? Then, grab the opportunity and memorize it right before you go to bed. It works! Did someone ever ask you to take a short walk right before your exams? These are small hacks that elders advise us right before we take exams. In fact, there are scientific reasons behind these small hacks. It helps to boost your memory. Take a small walk. While you walk, breathe in the fresh air and glimpse at the beauty around you. It helps. A lot of students believe it not necessary to strategize how they are going to study. They think that they will study whatever is possible and leave the rest. But, this is not a smart approach. You are working hard towards building a bright future. Why do you want to compromise on something less? Make a plan, and then start studying accordingly. Whenever you lose hopes or whenever you don’t feel like studying this plan will motivate you to proceed further. 1.) Fix a day to start studying. It is today or never. Don’t put forth your plans. If you plan to start today, don’t push it to tomorrow. 2.) The number of hours you plan to study in a day. 3.) Which are your weak subjects? Dedicate more time for these. 4.) How do you plan to work on those practice papers? 5.) How many times do you plan to revise? 6.) If there are any obstacles, how do you plan to overcome these? Answer these simple questions and you have a perfect plan ready. Also get more tips to get a good score in GATE exam. One, that if you study something entirely new just minutes before the exam, there is a high chance of forgetting it. And two, if you study something you have already studied but faced difficulty in remembering, then you might be able to recollect it. But we highly recommend you to keep your books away the moment you reach the exam center. Just be confident about your preparation and face the exam bravely. Also, before the exam begins, take a few deep breaths. Inhale and exhale and close your eyes in a deep prayer for a minute. Relax ! It’s going to be okay. Focus on your learning system. It does not matter how you reach your goals. All that matters is whether your present learning methods will take you to your goals or not. You can use any of the methods you find easy to learn, but whatever you do, the focus is important. Don’t forget your goal is to achieve success and pass your GATE exams with flying colors. Are you preparing for GATE exams? How is the preparation going? Are you preparing by yourself or attending some coaching center? How much does your GATE coaching center help you with the preparation? Share your thoughts, feedback and suggestions with us. 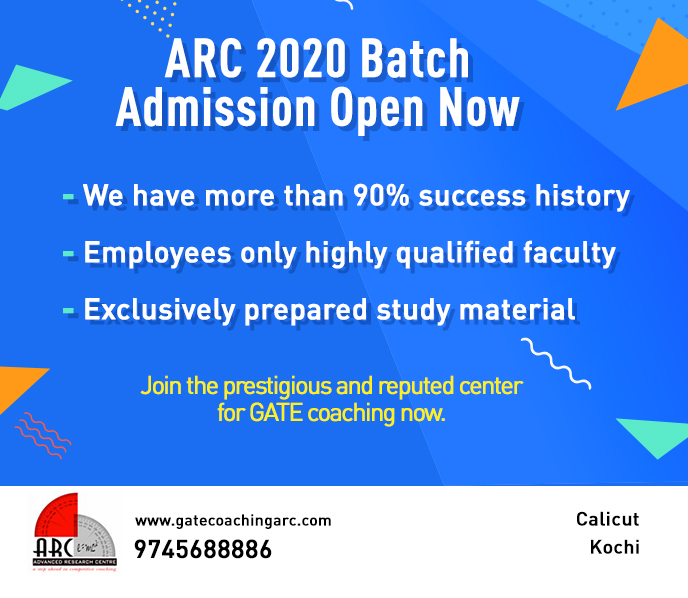 ARC Foundation is one of the Top GATE coaching centers in Kerala. Many students have realized their dream of GATE with help from our expert faculty at ARC Foundation. If cracking the GATE examinations is your dream, we invite you to come and join us. We will hold your hands and walk you through the GATE of success.